In the night of April 16, 2019, two people were medevaced from the "Costa Favolosa" off the coast of Fos-sur-Mer. The ship approached Toulon to allow this double evacuation. The first, a woman, was taken to Sainte-Musse Hospital because she had a miscarriage while the second, another 46-year-old woman, was reported to have had an appendicitis attack. The more than 6,000 passengers of the "Costa Favolosa" and "MSC Fantasia" were affected by the terrorist attacks in Paris on Nov 13, 2015. The ships moored on schedule in the morning of Nov 14 in the port of Marseille, but all excursion programs and shore tours have been canceled as a precaution in view of the unclear situation. The passengers, including many German, spent the day on board. On board there was a minute's silence to commemorate the victims of the Terrorist attacks. In addition, the flags were put at half-mast. Since the police has tightened the inspections in the port of Marseille, only French passengers who wanted to end their journey were allowed to leave the ships. Passengers from other countries remained on board. 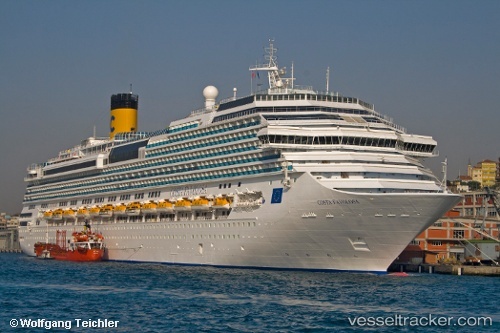 The departure of the "Costa Favolosa" could be delayed in the evening because the safety controls for newly embarking passengers were stricter than usual.